St. Patrick’s Day is coming up which can be a fun excuse to count, sort and graph Lucky Charms if you teach elementary school, and it’s also a reason to wear green. Beyond that, I’m going to admit that it isn’t my favorite holiday. Even though my family tends to jokingly repeat, “I gotta bit o’ Irish in mae” in our comically fake accents, we have never practiced any type of Irish tradition that would bind me to that nationality as opposed to my Scottish, German or English roots. If I’m completely honest I feel like an American mutt more than anything. But I guess you don’t actually have to be Irish to enjoy a reason to celebrate. In my case this year, it meant discovering what people are blogging about around St. Patty’s Day and I’m more than happy to discover it’s green food; more specifically, I’ve seen a whole lot of mint recipes. 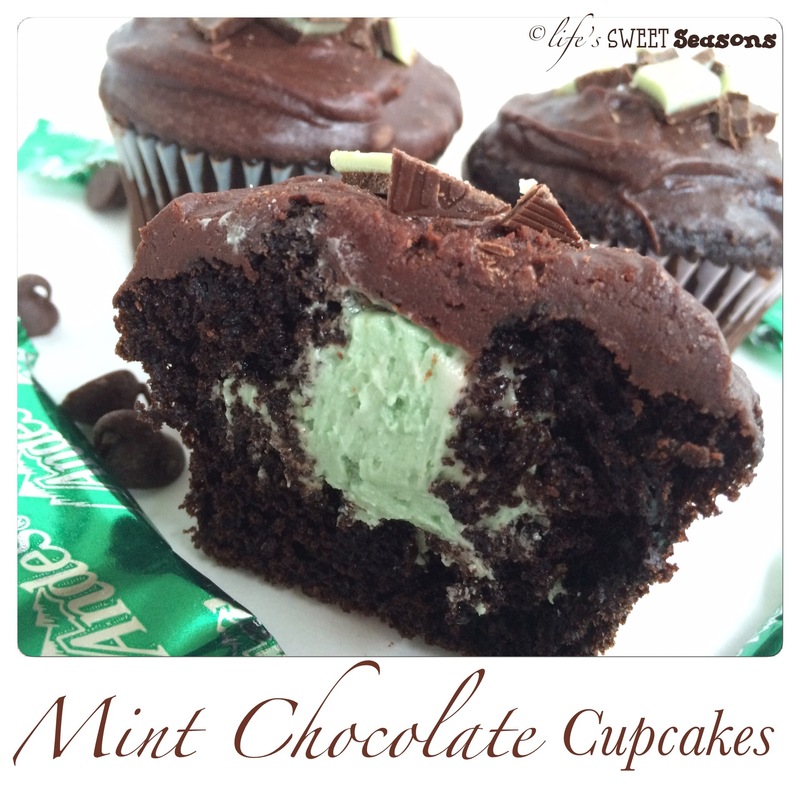 Mmmmm…mint and chocolate. Probably my favorite food combination of all time… So don’t be surprised when you see more than one recipe with these two flavors. I’m kinda an addict. 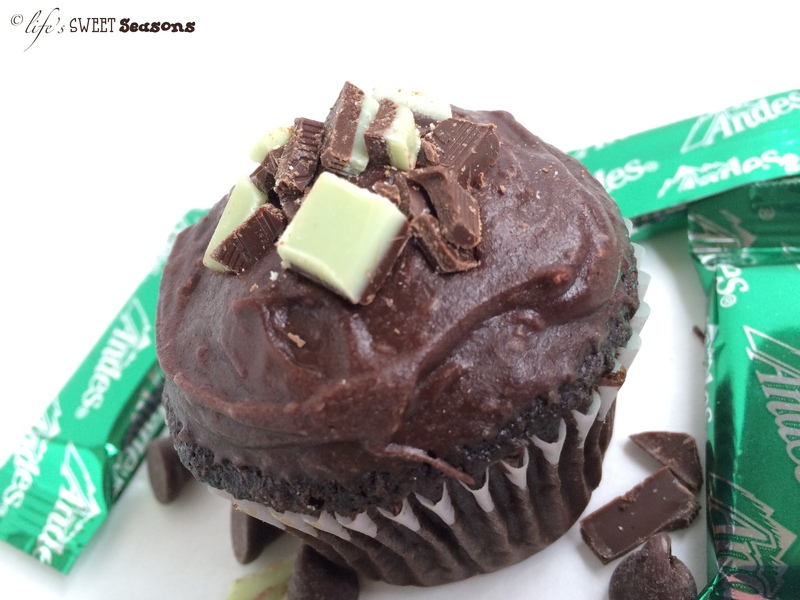 These cupcakes are definitely a change from the ordinary chocolate cupcake. There are a few more steps, but beginning with a boxed cake mix helps make life a little easier. The trickiest part of this recipe might be finding the Duncan Hines flavored mix-in packet. For a while I was seeing these in every grocery store, but lately I haven’t been able to find one. I might be forced to rewrite this recipe in the future using mint extract and green food coloring. For now though, this is what I used and we were very happy with the results. The green filling makes these extra fun for March 17th! While allowing the cupcakes to cool begin the cream filling. Beat butter and shortening together. Add one cup of powdered sugar and salt. Beat well and then add milk, vanilla, and rest of powdered sugar. Finally, add the Mint Chocolate flavoring. You might want to add half the packet first, beat, and then taste test as you go. Mike and I found that he liked a lighter mint flavor than I did. I would use the entire packet, but if you’re not a huge mint fan you might take your time and try it little by little. For the ganache- heat butter and milk in a large microwave safe bowl for about a minute and a half. (You can also heat it on low on the stove, but why wash a pot if you don’t have to?) Add the chocolate chips and whisk until the chips have melted completely and the ganache is smooth. Add vanilla. At this point the ganache will be thin. Allow it to sit out at room temperature until it has thickened or pop it in the fridge for about five-ten minutes. When it has thickened, take each cupcake and dip it upside down into the ganache. Spin the cupcake in the chocolate and then lift it up out of the bowl & allow to solidify uncovered on the counter. This makes enough ganache to do every cupcake twice. 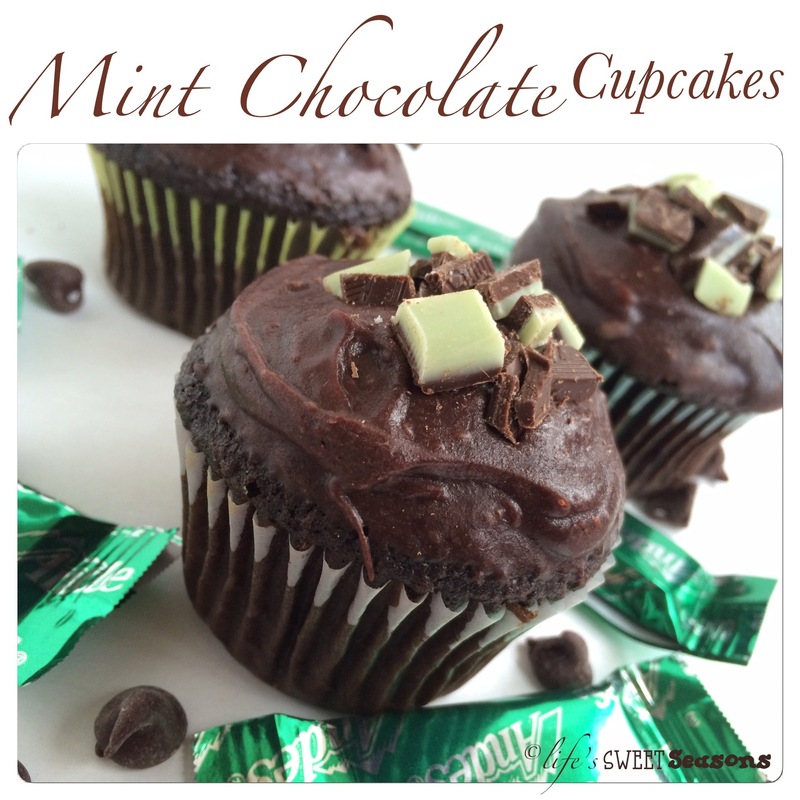 Once you’ve swirled them all, go back for round two and then top with Andes mint pieces. Notes – If you can’t find the Duncan Hines frosting mix-in, no worries. You can try a couple things. The first is to try a packet of mint hot chocolate powder. I haven’t actually done this yet, but I can’t wait to try it. The second comes with a warning. If you don’t mind the taste of spearmint, try adding 1/2 teaspoon mint extract to the frosting along with a few drops of green food coloring. Again, keep in mind that “mint” extract tastes somewhat like toothpaste and some people aren’t fans. 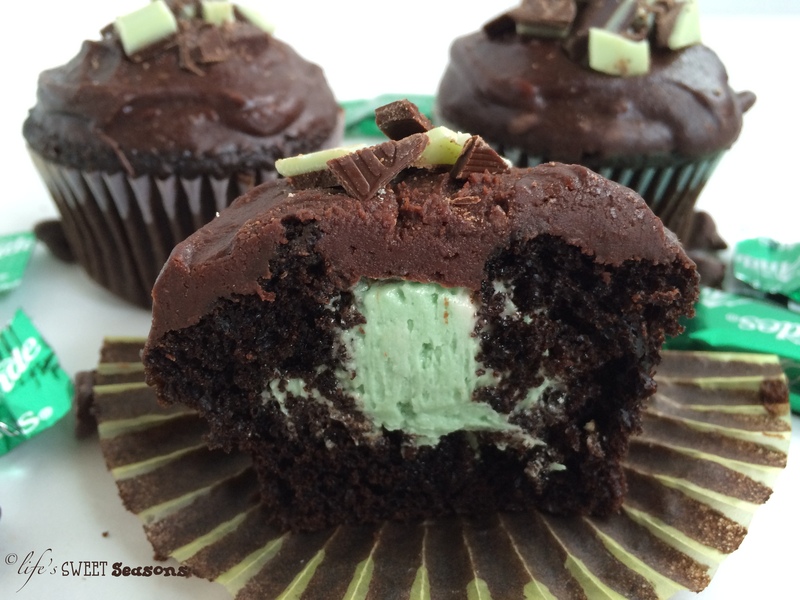 If you hate the idea of spearmint, you can add peppermint flavoring instead, but you’ll end up with my Peppermint Cream Filled Cupcakes rather than mint chocolate.